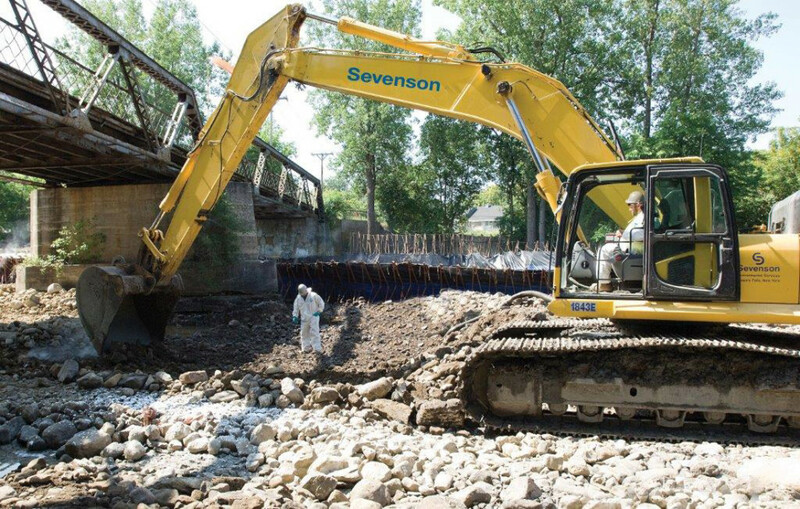 Design/build sediment remediation and restoration project along a ½ mile of river bed and embankments required careful planning and execution. Project scheduled over multiple construction seasons. Constructibility review was incorporated into remedial design and the project planning process. Included was the analysis of multiple remediation methodologies, impacts and costs. Installation of 65 lf by 1,125 lf fish channel Porta-dam capable of handling river flows of 1,700 CF including a head water dam constructed with H-piles and steel plates to divert river flows. River diversion system modified in year three (3) to cantilevered AZ48 steel sheeting with concrete block bracing for stability. Excavation in the dry was selected sediment removal methodology. Erection of 180 LF by 132 lf fabric structure with a stone and asphalt pad to house screening and stabilization operations. A carbon vapor extraction air handling system is operational during processing of waste materials. Excavated sediment was transferred to stockpile area for screening and stabilization for offsite T+D. Install and maintain a 59 LF by 13.5 lf temporary bridge for operations on opposite side of river. Install 916 LF of AZ19 sheet pile around perimeter of job site for a NAPL collection trench. Construct a 393 LF three tiered stacked stone wall along an eroded riverbank. Develop and implement a HDPE bypass system for a main concrete outfall for the City of Plattsburgh. Construct, operate and maintain on-site temporary 1,000 gpm waste water treatment plant 24 hours per day, 7 days per week. Restoration of river bottom and embankments to original grade and contours of the river. The site is located on Saranac Street in the City of Plattsburgh, New York. The site is undeveloped, occupied primarily by open grassy areas with some woody vegetation including trees and shrubs along the Saranac River. The lower Saranac River is designated by the NYSDEC as a Class C River. An electricity generating plant was constructed on a portion of the site in 1891. A coal tar lagoon was used to store waste generated by the plant. By 1949, the plant had expanded to its largest size and included three (3) gasholders. The electricity generating plant was converted to a utility garage and repair shop, and commercial businesses were established in several other site buildings. MGP operations ceased around 1960, and the site was used as a NYSEG service center until 1980. The site has been vacant since 1980. Sediments in the Saranac River are contaminated with MGP-related materials including coal tar, sheens, and odors from earlier operations. As a result elevated levels of VOCs and PAHs have been documented. After several years of studies a remedial action work was developed for the site. 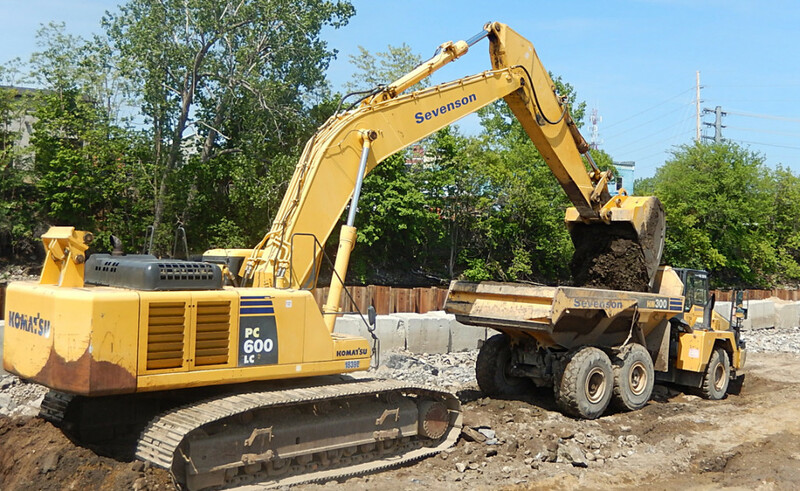 Sevenson was awarded a design/build contract from New York State Electric and Gas Company’s (NYSEG) parent to complete the cleanup at this former MGP site. Sevenson selected ARCADIS as its team partner to execute the RD components of the project. During RD Sevenson and ARCADIS participated at regularly scheduled constructability review sessions. The purpose of the constructibility review sessions was to evaluate and price a variety of remediation alternatives; identify the most appropriate approach to meet the regulatory requirements surround the project; and establish the means and methods to implement the selected remedy in a safe and cost-effective manner under “best value.” Constructibility was ongoing throughout the RD process. 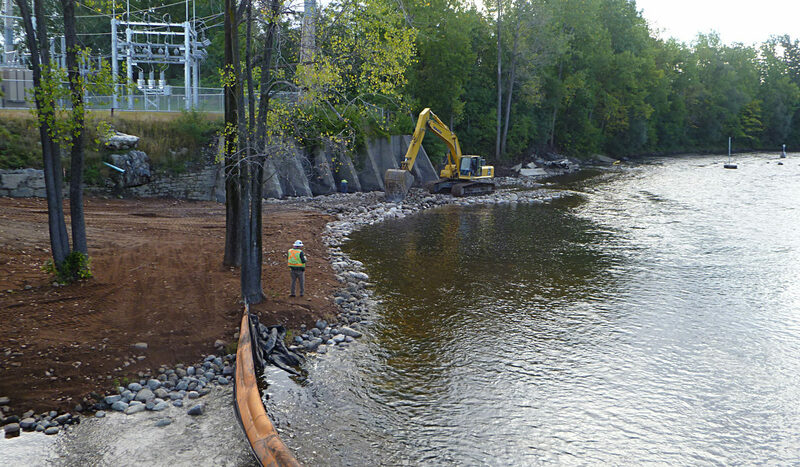 Preparation work began with the clearing of trees and vegetation along the eastern bank of the site to facilitate access to the Saranac River. Vegetation along the western bank was selectively cleared to allow for installation of the fish passage channel. 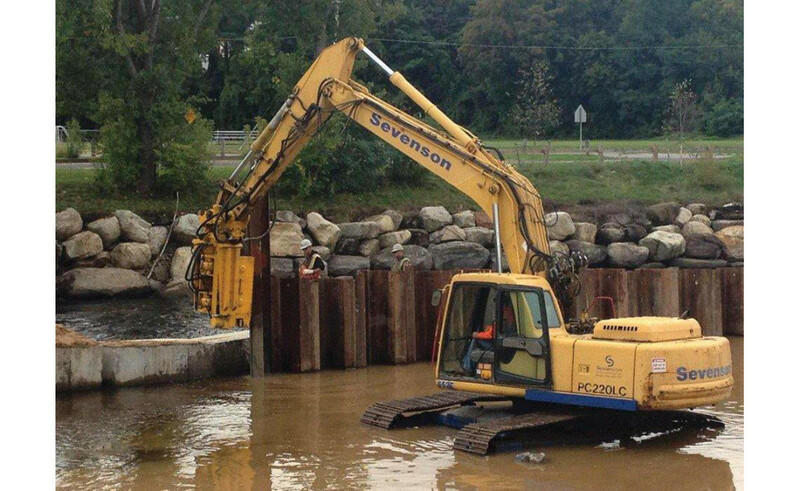 A second clearing operation also took place along the far shore of the NYSEG property to facilitate sediment excavation. A fabric structure 132 feet by 180 feet was erected to enclose the material staging and processing area. The fabric structure includes two (2) 14 feet by 14 feet overhead doors and two (2) man doors located at opposite ends of the structure to allow equipment and personnel access into the building. Heavy equipment operating within the structure is equipped with carbon dioxide (CO2) scrubbers. In 2014, Sevenson poured 350CY of 4,000# concrete to strengthen the floor of the fabric structure. Along with a new floor; new fabric was installed at the end of the 2014 season.A vapor extraction system is sized at four (4) air exchanges per hour integrated into the fabric structure to maintain air exchange requirements as well as collect and treat vapor. The two (2) systems contain 20,000 lbs of carbon each. The vapor extraction system is designed to treat ambient air within the fabric structure via inline particulate filters and a vapor carbon filter system to remove dust and nitrous oxides prior to release into the atmosphere. The Saranac River is a major recreational use river. Recreational portage areas were installed upstream and downstream of the project boundaries to allow continued access to the Saranac River. The portage areas provide users a means to bypass the active work zone. Erosion and sediment control measures were installed to limit the potential for offsite material migration due to stormwater runoff in areas subject to erosion as well as limit excess sedimentation associated with on-site drainage pathways. Historic stream flow data from United States Geological Survey (USGS) gauging station on the Saranac River at Plattsburgh, New York. A HEC-RAS hydraulic model of the Saranac River, from its mouth upstream to the Imperial Dam, as provided by the NYSDEC. A modified HEC-RAS hydraulic model which includes detailed river bathymetry data within the project area and detailed layout of proposed hydraulic controls.The maximum capacity of the river bypass system, determined through hydraulic modeling, was approximately 1,700 CF. This flow rate represents the maximum flow that can be passed through the fish passage channel without overtopping the upstream cofferdam or the supported side walls of the fish passage channel. 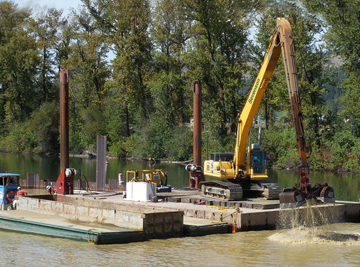 A cofferdam was constructed at the upstream limits of the riverbed excavation area to effectively isolate the active work area from the river flow. 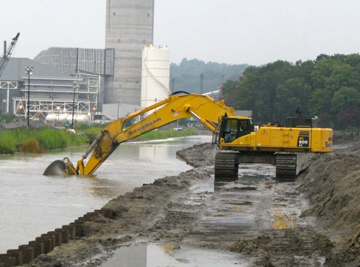 The cofferdam was composed of a series of king piles installed into bedrock, with steel lagging panels inserted between the king pile supports.Beginning in 2012 in an effort to lower costs, Sevenson utilized AZ48 sheet pile for the headwater dam, backwater dam and centerline sheeting. 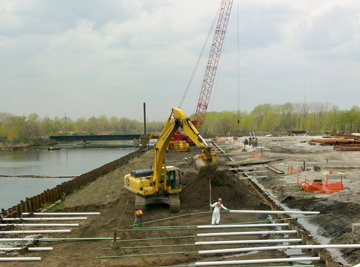 From 2012 – 2015 over 3,700LF of AZ48 sheet pile has been installed and removed. Prior to sheeting installation turbidity control measures were installed downstream of the work area. 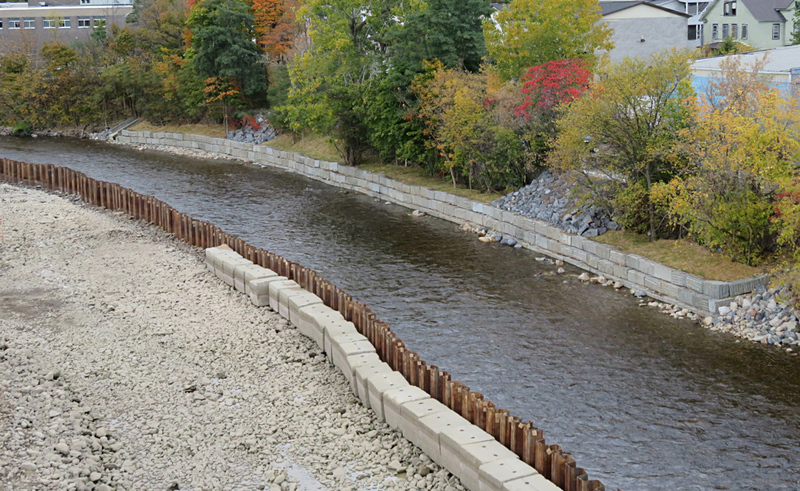 In addition to the diversion dams and bypass system, a fish passage channel was installed along the riverbank, opposite the active work area. The objectives of the fish passage channel are to allow for fish passage during median river flow (600 CF) conditions.A support structure serves as the interior side of the fish passage channel while the opposite side is formed by the existing riverbank. The entire fish passage channel is lined with flexible membrane liner (FML) to reduce the potential for scour along the riverbed and the existing riverbank.The fish passage channel allows fish passage around the active work area during construction. The fish passage channel was designed to limit flow velocities and maintain water depths at levels that are conducive to fish passage. 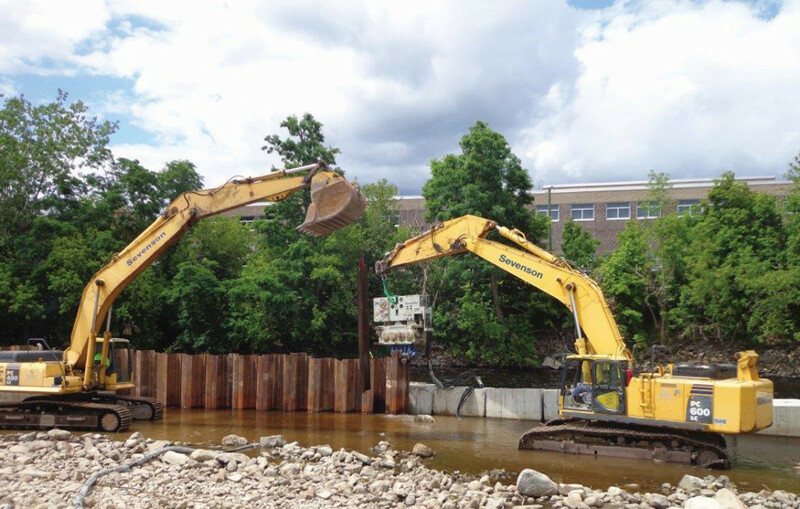 Once the temporary diversion sheet pile was in place, dewatering of each cell commenced. Dewatering was accomplished through the use of Godwin Model CD150M Dri-Prime pumps equipped with a 71 hp diesel engine. 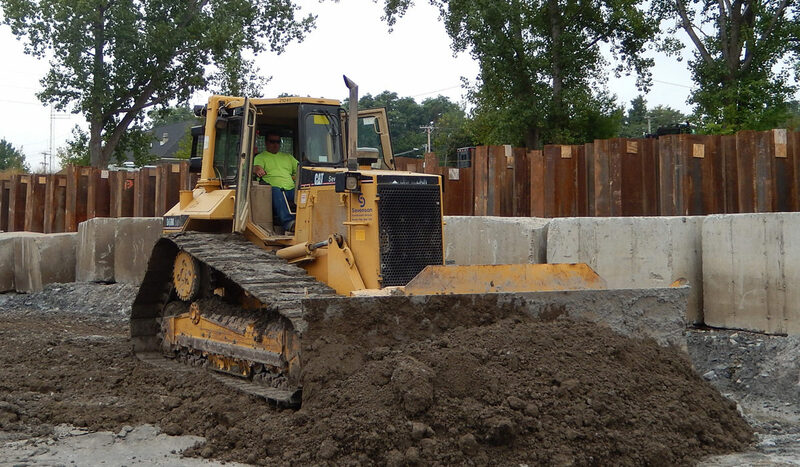 Dewatering is a 24/7 operation to ensure each cell remained dry during excavation and backfill. Prior to initiating any excavation operations, a temporary waste water treatment system (WWTS) was installed. 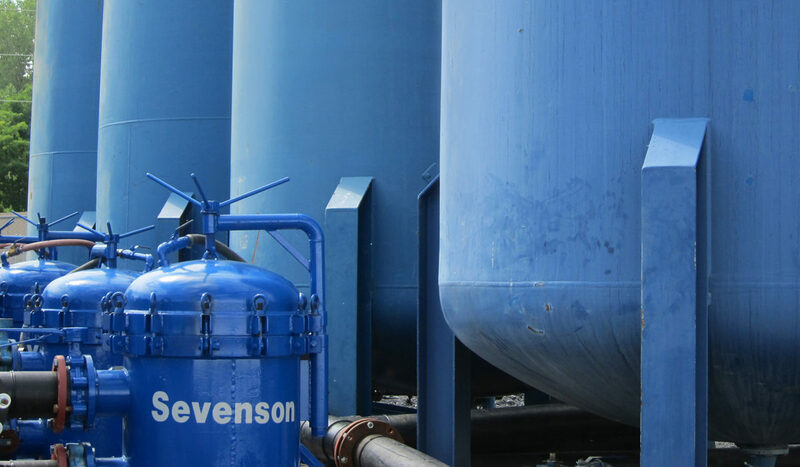 The WWTS is designed to remove suspended solids, oil and grease, insoluble metals, VOCs, and semi-volatile organic compounds (SVOCs) from water generated during construction operations. 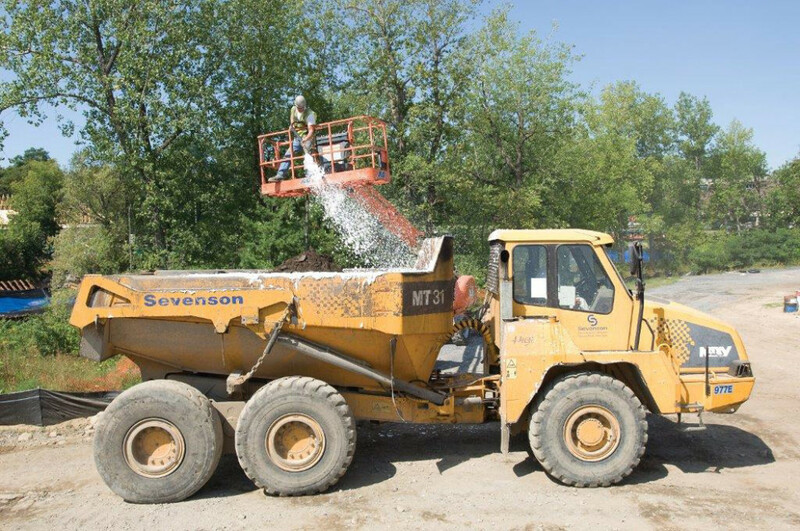 The WWTS treats all water generated from dewatering and soils and sediment excavation operations. 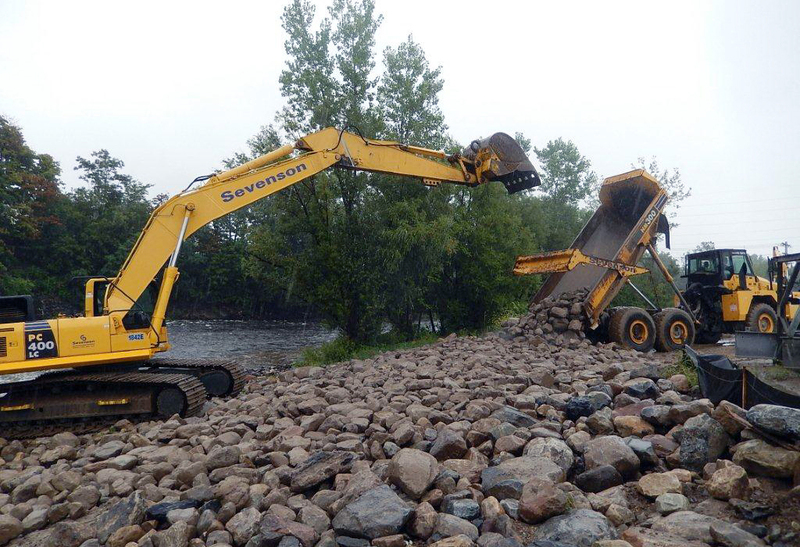 Excavation of riverbank soils and sediments is to the depth of till or bedrock.Riverbed sediment and soils are removed from the Saranac River. An estimated 48 percent of the riverbed sediment volume is assumed to be a cobble/boulder fraction from the 0 to 2 foot surface interval, which will be reused as part of the riverbed restoration.Excavated material is transported to the material staging area for processing via solidification. Characterization of processed sediments is done to confirm that processed material meets treatment criteria. To date over 78,000 tons of impacted material has been loaded onto trucks for offsite T+D. During the 2014 – 2015 seasons a 59 lf temporary Mabey bridge was erected over the river bypass system. 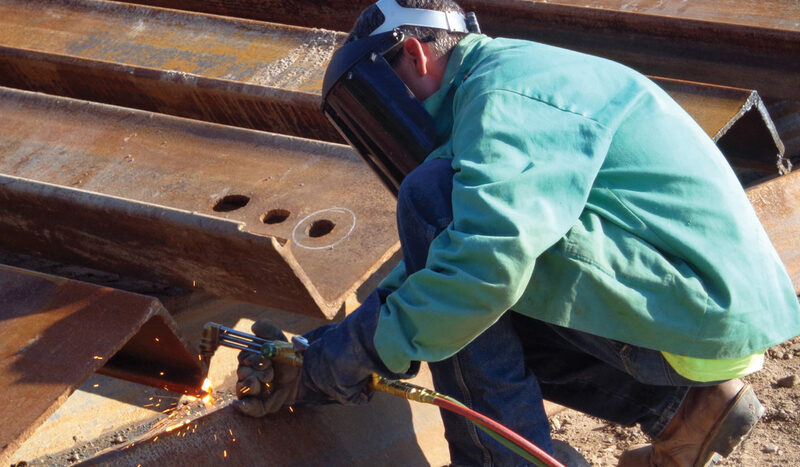 Steel bridge abutments were fabricated and installed prior to deployment of the temporary bridge. The bridge was utilized to transport impacted material to the landside of the job for stabilization within the fabric structure. In August 2015 a three tier stacked stone wall was constructed along the far side riverbank where significant erosion was observed. Cut stone blocks weighting approximately 5,000lbs each were precisely placed one tier at a time. After each tier was complete, geotextile and imported backfill were placed behind the stacked stones. Sevenson designed and constructed a NAPL collection trench along the perimeter of the job site in 2013. 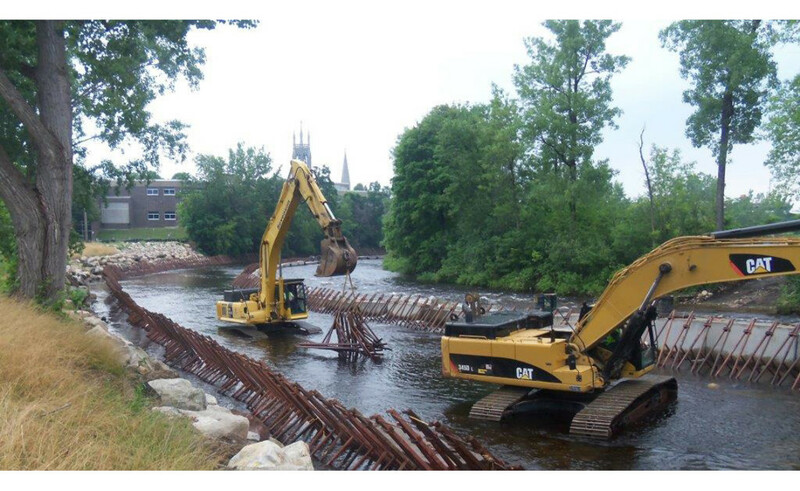 A total of 916 LF of AZ19 sheet pile were utilized to restrict any potential impacts from reentering the Saranac River. DeNeef Swellseal WA was inserted in each sheet pile lock to ensure the collection trench was water tight. Within the collection trench (13) HDPE collection sumps were also installed. Unique Characteristics: Waste processing was conducted inside a Sprung Structure equipped with a ventilation system. Perimeter air monitoring program was implemented to protect neighborhood. Safety Staff: Health and Safety Officers were onsite during remediation operations. How 40-Hour Training Was Implemented: Sevenson provides training to all project management, field supervision and labor, in-house, by the firm’s CIH, Paul Jung. Both 40-hour and 8-hour Occupational Safety and Health Administration (OSHA) training for all on-site employees was completed.